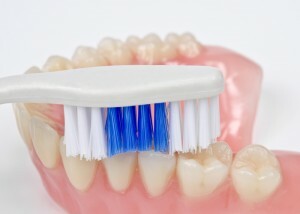 cleaning-denturesIt is extremely important to clean your dentures with a soft brush and a cleaning paste, or soapy water, after each meal. Food particles that are trapped under the denture can cause inflammation of the gums and sore spots. 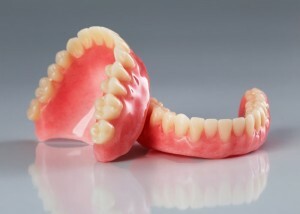 You should remove your dentures for at least 6 hours daily, usually when going to bed at night, to give your gum tissues a rest. During this time, the dentures can be cleansed and placed in a small tub of water to prevent them from drying out, which can cause the dentures to distort and not fit well. At least once a week, place them in an enzymatic or special cleaning solution to remove those otherwise insoluble stains and proteins. Because foods will stick to the soft tissues of your mouth, it is also beneficial to brush the roof of your mouth and your tongue daily. Massaging and stimulating these tissues will reduce the incidence of inflammation and sore spots.